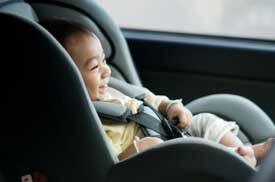 In Canada, child car seats must meet the National Safety Mark (NSVAC). If your seat meets this standard, bring it ! It’s free on the plane and your child will be as comfortable as at home. Otherwise, it will be necessary to think of renting a child seat with your vehicle, option which will be payable in advance or not, according to the renters. Attention, it is not all the renters who suggest this option. A new Quebec Highway Safety Code measure comes into effect on April 1, 2019. In general, Canadian law requires that a child be at least 145 centimetres tall or at least 9 years of age before wearing the seat belt alone. It is also strongly recommended that children aged 12 or younger always sit in the back seat. This is the safest place for them, since they are seated as far away as possible from the points of impact in the event of a head-on collision.